The practice of street design evolves slowly, but it does evolve. Every decade or so, a new technology like the bulb-out or the cycle track arrives on the scene to help us make our streets better. This quick article — for serious street geeks only — addresses a new type of street modification that holds great promise for improving the safety and walkability of a certain type of intersection: the fork. If your community has no forks — or you are not a serious street geek — please feel free to stop reading here. But that does mean that you will miss the awesome video. Forks often need fixing because they create complicated intersections with dangerous sight lines and signals with too many phases, impeding the flow of both vehicles and pedestrians. Forks are fixable because they hold redundant roadway, an excess of asphalt that serves no purpose except to encourage higher speeds and lengthen crossing times. The first person in the current era to have acted upon this crisis/opportunity may have been Janette Sadik-Khan, who oversaw the reconfiguration of a number of forks along Broadway in Manhattan, most notably at Times Square. 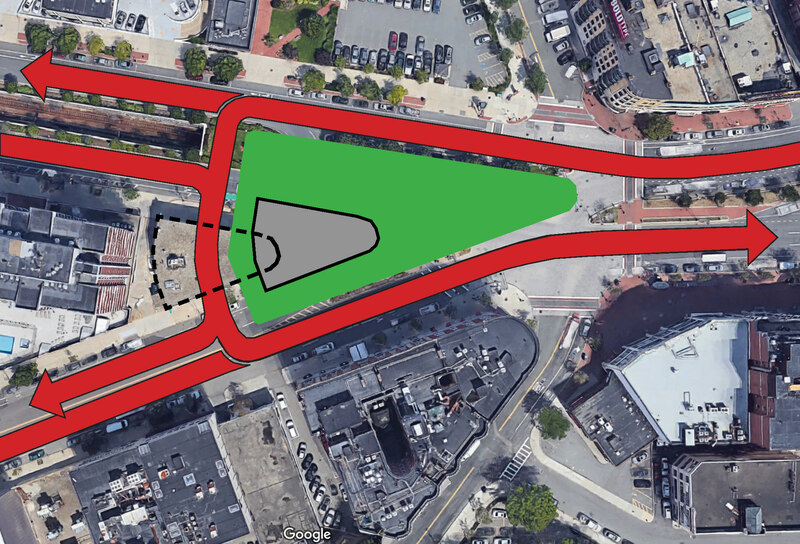 Her team’s interventions simplified those intersections in a way that improved both public safety and traffic flow while converting driving space into much-needed public space. The classic Manhattan fork fix. 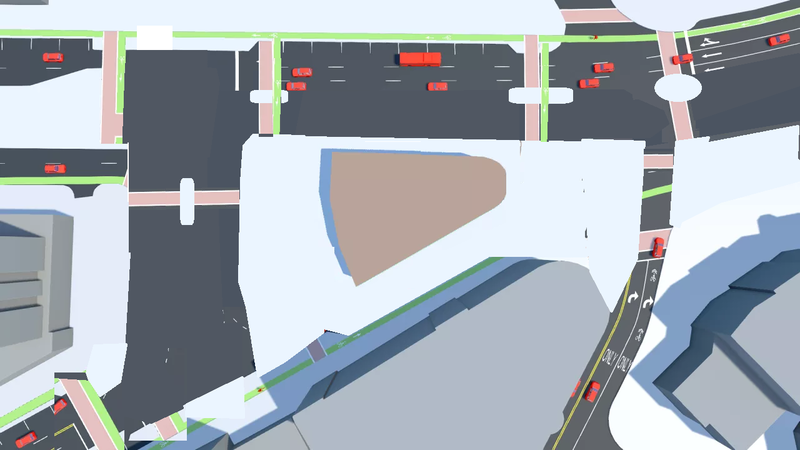 Notice how one block of one of the merging roadways is eliminated, replacing an unwieldy five-point intersection with something standard, and allowing the expansion of the small open space at the fork. The simplification of the traffic pattern explains why, in Times Square, the reduction of roadway led to improved safety and fewer delays. A recent fork repair in my area, Cambridge’s Lafayette Square, shows a slight twist on the model pictured above. One leg of the fork has been snipped and replaced by a public plaza, as usual. But, because the north-south cross-street staggers, a dogleg curve was needed to resolve the traffic flow. It looks awkward. . . and works just fine. These successes were on my mind when a new client asked me to meet him one morning in Boston’s very forky Kenmore Square, to review a tower he was building at a prominent flatiron corner — in the middle of the Square’s western fork. The challenge in Kenmore Square is that there are no cross-streets for rerouting traffic as in the above examples. The only opportunity lay in my client’s own site, which, if vacated, could become a cross-street instead. The good news was that the resulting street layout would create a new building site much larger than the old one. The four-step diagrams below illustrate what seemed to be the best solution. Rather than fully closing one leg of the fork, it seemed wiser to close half of each, to limit the width of any one leg. 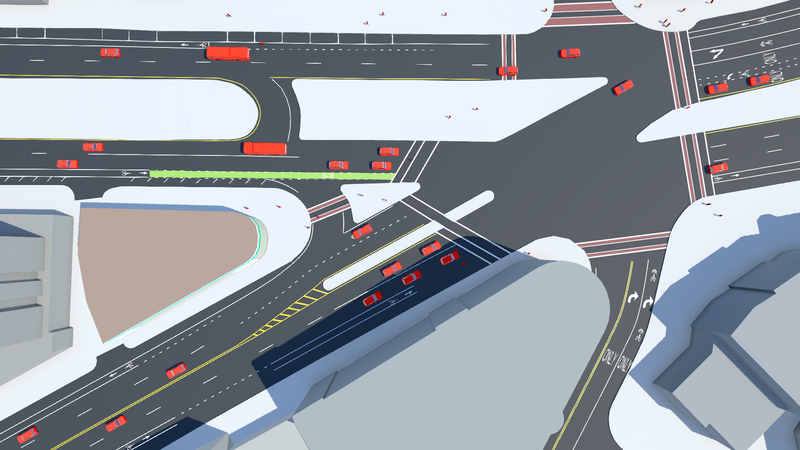 In image two, a new cross-street through my client’s site allows one eastbound leg to be closed. In image three, it allows one westbound leg to be closed. The result is a new island big enough to hold both the displaced building and a public plaza. A new street diverts eastbound Commonwealth Ave.
And then diverts westbound Beacon St. In addition to removing asphalt and drastically shortening crossing distances, this change should also reduce dangerous driving by interrupting sight lines through the square. While it requires more turning motions, the new configuration adds efficiency by simplifying the main traffic signal from four phases to three. This outcome is the result of pulling the transition from Commonwealth to Beacon out of the square, so that it no longer conflicts with pedestrian flows. 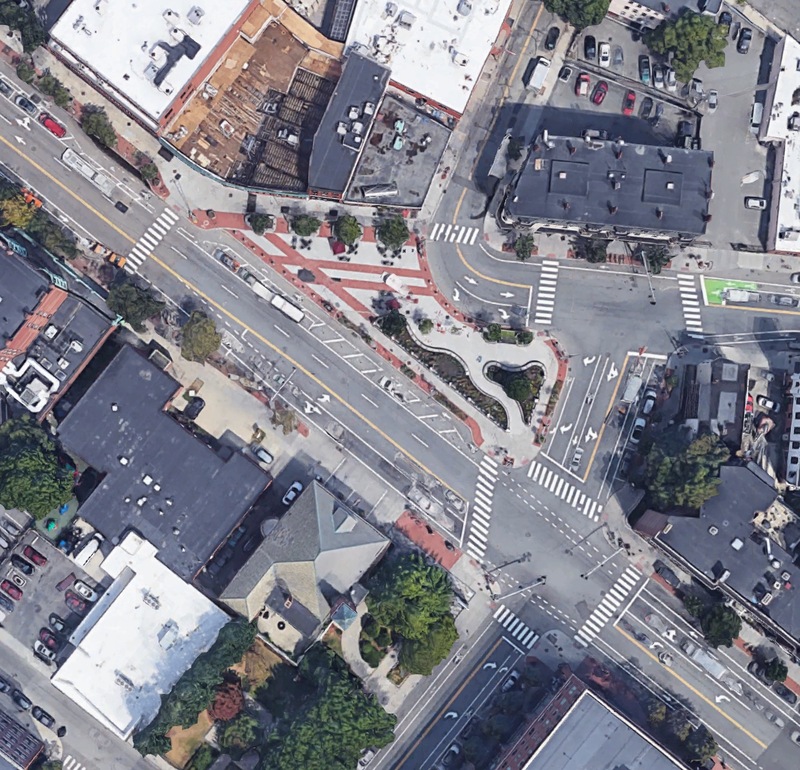 The result is a Kenmore Square whose heart is a public space rather than a busy roadway. The current layout, with the new tower site just left of center. 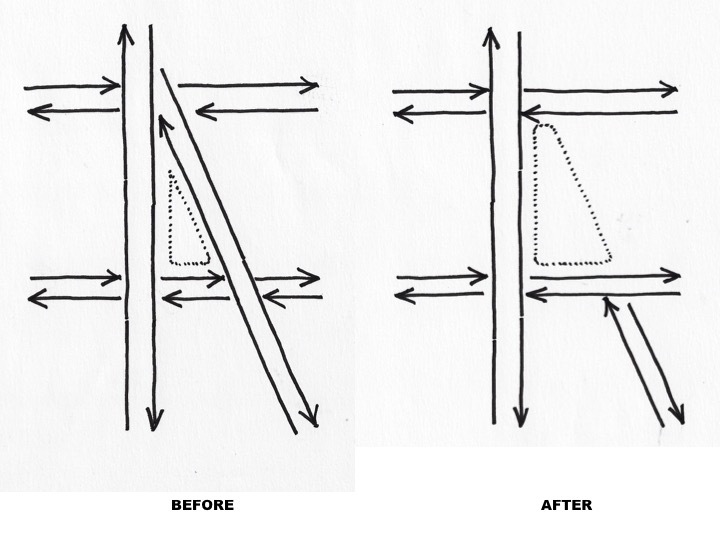 When explaining such a complicated street reconfiguration, conventional graphics can fall short. For that reason, we commissioned a video from a former game designer, Spencer Boomhower of Cupola Media. Any confusion that persists at this point should be clarified by the video. Kenmore Square Square from Cupola Media on Vimeo. So, how did my client feel about the new square? Excited enough to replace his already-submitted plan. More to the point, it became clear that this alternative proposal, with its traffic improvements and large new public space, addressed head-on a number of concerns already raised in the community. City planner Jeff Speck, AICP, CNU-A, LEED-AP, Honorary ASLA, is the principal of Speck & Associates and the author of the best-selling book Walkable City and the just-released Walkable City Rules, 101 Steps to Making Better Places. Im not a huge fan of the proposed redesign. The issue is, driver behavior. That right/left turn for drivers on Comm Ave going east is a recipe for bad behavior because theres no penalty for doing anything wrong. Incredible. Beautiful. 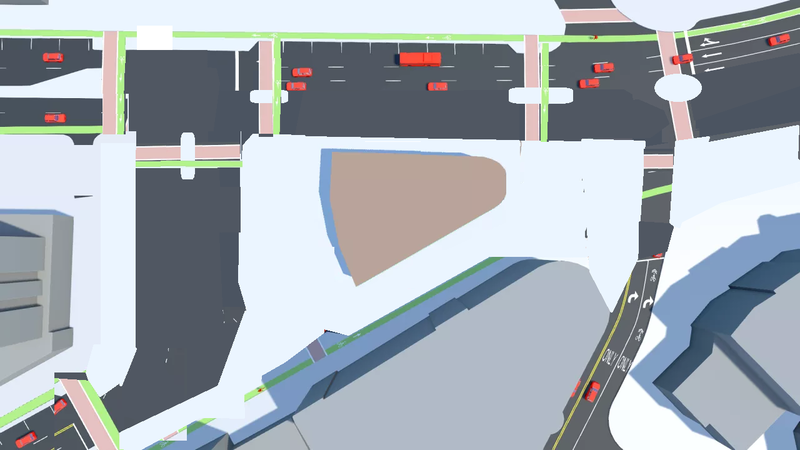 This looks like it will drastically improve Kenmore Square, along with the complete protected bike network. When I lived in Boston, it was always a nightmare crossing the square, and it’ll be awesome to have some public space there now, on par with the gorgeous Harvard/Davis/Central/Kendall squares of Cambridge. Bravo! It is best practice to reduce over-complex intersections, particularly when some approaches have difficult sight lines. 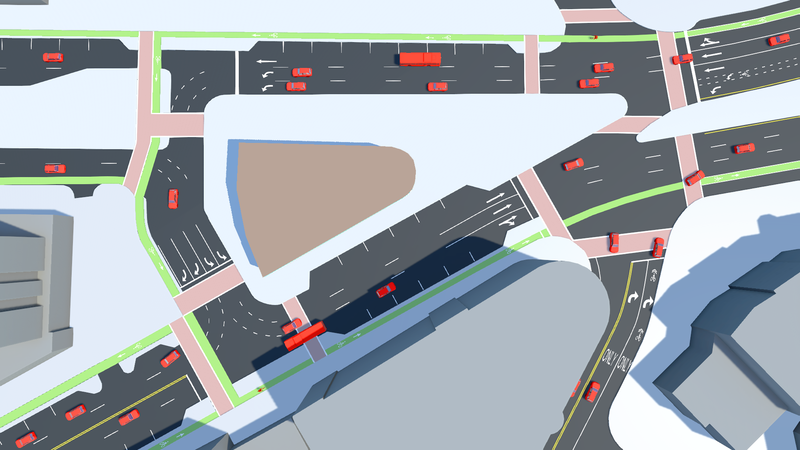 There isn’t enough room in many cities for another way to solve these issues, but when the space is available roundabouts accomplish similar improvements in safety – plus reducing air pollution, noise pollution. wasted fuel, wear on vehicles, and lost travel time for all users. Generally, streets should meet at right angles and the long leg of any triangle should be removed. Two smal streets take up more space than one large one. Generous pedestrian islands can make long crossings safer. Although I think this is a nice solution to a tricky problem, I think the one way section of Beacon is a waste of space. Furthermore, big medians are usually a waste as well. I suggest slimming down or eliminating the medians, and having a single road twist through the square. I hope you get the idea from this modified plan. Here is an improved version of the upper left. What could a driver do wrong? Drive across a pedestrian plaza? Put some street furniture (lights, signs, planter pits, trees and that isn’t a problem. 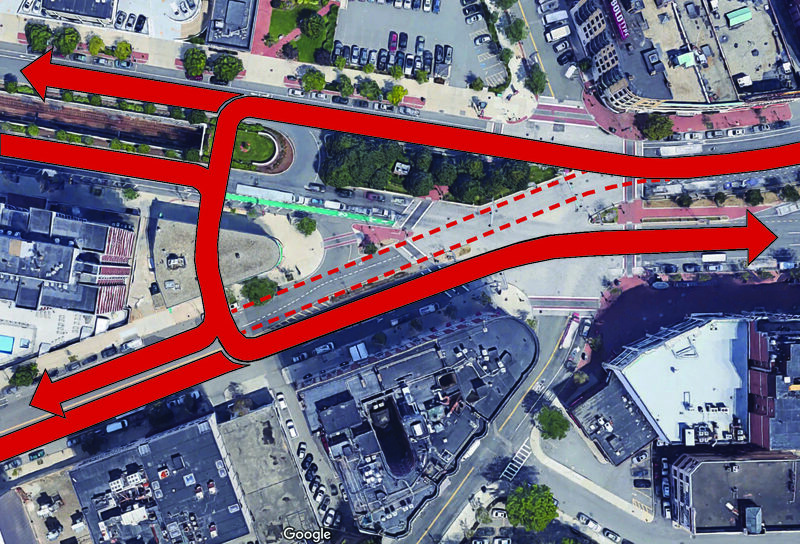 “The result is a Kenmore Square whose heart is a public space rather than a busy roadway.” The plaza is still sitting in the middle of 6 lanes of traffic. Sounds like there will still be quite a busy roadway there. Jeff Speck again shows his lack of bike bonafides with this design. There are so many poor details regarding bike access and circulation, not to mention conflicts with vehicles. Hopefully the actual design, should it come to pass, gets considerable changes. You know, one can critique a design without personally attacking the designer. It is possible. Block the box. Constantly, especially with the weave between left and right turns. Something like this would be great for the diagonal block of Hollywood Blvd in Los Angeles, between Vermont and Hillhurst. Both ends of that block are currently very confusing six-way intersections, that could be greatly simplified if the diagonal block of Hollywood were closed to vehicle traffic (vehicle access to parking lots on that block can still be achieved from side streets). Through-traffic can be diverted along Sunset Blvd (or Santa Monica, or other streets, depending on how far drivers are traveling). Its a concept stage design. All it needs to do is show that there is space for a segregated cycle facility, ffs. I eagerly await your specific suggestions for how the design could be improved. The redesign is really just a triangular traffic circle with right-in and right-out movements. There’s just one side of the circle missing (at the apex), where there is an oddball left turn.